ESO Supernova Exhibition — What happens if you fall into a black hole? The gravitational attraction of a black hole is so strong that not even light can escape it. As a result, black holes are one-way doors in the Universe. No-one knows what goes on inside, except that matter is compressed to an incredibly high density. Spaghettification: A black hole would stretch an astronaut’s body into a thin ribbon, since the gravity pulling on their feet is so much stronger than on their head. One-way door: A black hole’s event horizon is the “point of no return”. Nothing can escape from within, not even light. Current theories say there’s a point of infinite density in the centre – the singularity. A jump into a black hole is a one-way trip. Black holes are regions of space where gravity is so strong that nothing can escape them, not even light. Even before you reach the event horizon – the point of no return – you would be “spaghettified” by the black hole’s tidal forces. Astronomers do not actually know what goes on inside black holes. Current theories predict that there is a dimensionless point with infinite density at the very centre of every black hole. But current theories may be wrong. Singularity: If spacetime is visualised as a two-dimensional surface, a black hole’s singularity could be represented as a bottomless pit. 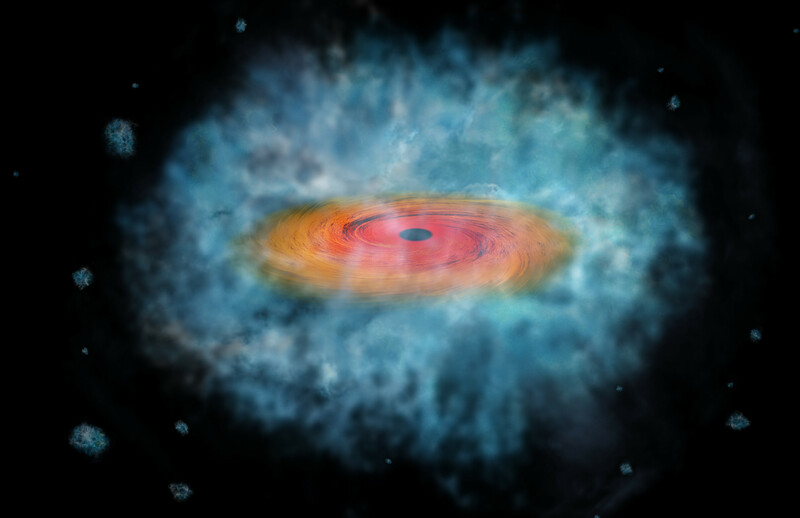 Shadow play: Since its gravity bends starlight from behind it, a black hole’s event horizon may show up as a dark shadow in future high-resolution observations (artist’s impression). Would you dare to jump into a black hole? Probably not a good idea, as you’ll never be able to get out again. Not even light can escape from a black hole – and light is the fastest thing we know!